Woodbridge, Connecticut marked a milestone this week for its 2.2 MW fuel cell microgrid project, with an announcement that the fuel cell component is now operating. The fuel cell was provided by Connecticut-based FuelCell Energy. During power outages, the microgrid will island and serve seven critical buildings in the small town near Hartford. These include the local high school, town hall, library, fire station, public works facility and senior center/emergency facility. The remainder of the time the fuel cell will supply the regional grid. 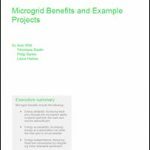 The fuel cell microgrid has received $3 million from the state’s microgrid grant program and additional funding from local utility United Illuminating. The utility is using the project to help meet its state requirement to develop 10 MW of renewable energy. The fuel cell is now running, but the remainder of the microgrid remains under construction. FuelCell Energy will operate the fuel cell under contract with UI. The unit converts natural gas into electricity and heat through a highly efficient electrochemical process that requires no combustion, so creates no accompanying emissions. FuelCell Energy also is designing the microgrid controller that will run the project’s automated operation. 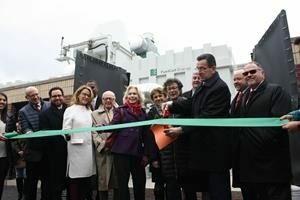 Several Connecticut dignitaries attended a ribbon cutting for the fuel cell on Monday, including Gov. Dannel Malloy. “It is critical that even when the lights go out due to severe weather events, essential government support and services are available, and microgrid projects like this are exactly how we can do that,” Malloy said. Anthony Marone, president and CEO of UI’s parent company, UIL Holdings, a subsidiary of Avangrid, noted that in addition to supplying power, the fuel cell microgrid will act as a heat source for Amity Regional High School. “We view this project as a triple win including clean power for the community, reduced financial impact on the district, and educational opportunities for our students from this innovative fuel cell power generation,” said Charles Dumais, superintendent of the Amity Regional School District #5. The project also will contribute to Connecticut’s renewable portfolio standard, since the state designates fuel cells as a class 1 form of renewable energy. The standard requires that the state get 22.5 percent of its electricity from renewables this year. 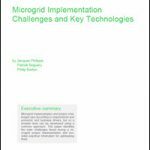 Track news about fuel cell microgrids by following us on Twitter @MicrogridNews.